On 24 March 2017 Australia and China signed the Joint Statement on Enhancing Inspection and Quarantine Cooperation between Australia and the People’s Republic of China. The joint statement provides Australian exporters with improved access to the world’s third-largest consumer of beef and will facilitate an increase in the number of eligible establishments permitted to export chilled and frozen red meat to China, pending the outcome of an audit. China is Australia’s fourth-largest export market for beef behind Japan, the United States and the Republic of Korea. In the five years to 2016–17, China accounted for around 10 per cent of Australian beef exports in value and volume terms. 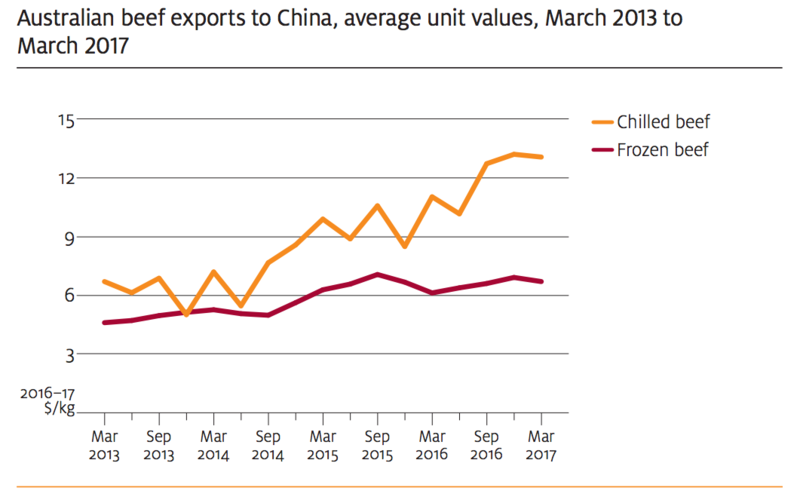 The share of chilled beef relative to frozen beef exported to China has been increasing, but most Australian beef exported to China is frozen. In 2016–17, 7.0 per cent of exports are estimated to be chilled, up from 5.8 per cent in the previous year and 5.2 per cent in 2014–15. Strong growth in demand has driven up the value of Australian chilled beef exports to China. Between the March quarter 2013 and the March quarter 2017, export unit values for Australian chilled beef to China rose in real terms by 95 per cent to an average of $13.06 a kilogram (in 2016–17 dollars). This increase in chilled beef export unit values is large when compared with increases in frozen beef export unit values— which have averaged around $6.50 a kilogram since March 2015. Prices for frozen beef in China are forecast to fall in 2017–18 as competition increases from other major exporters, particularly Brazil and the United States. In contrast, Australia’s competition in the chilled beef market is limited in the short term to New Zealand, which gained access to the Chinese chilled beef market in March 2017. The United States is expected to resume exporting beef to China in July 2017 for the first time since 2003 as a result of a trade agreement between the two countries announced in May 2017. The United States already ships a large volume of beef to other markets in the greater China region, and much of the increase in US exports to mainland China is expected to be diverted from these markets. US frozen beef imported into Hong Kong during this period was around 50 per cent more expensive than the equivalent from Australia. In 2017–18 the weighted average saleyard price of beef cattle is forecast to fall by around 3 per cent year-on-year to average 525 cents a kilogram (carcase weight) after rising by an estimated 6.9 per cent in 2016–17. This forecast fall reflects strong competition in export markets, which is expected to place downward pressure on saleyard prices for cows and heavy steers. Expanding US production is forecast to increase US exports to Japan and the Republic of Korea and to reduce import demand in the United States. The forecast fall in average saleyard prices also reflects expanding beef production in Australia. In the second half of 2017–18, cattle turn-off is forecast to rise due to an expanding cattle herd increasing the supply of cattle available for slaughter. This is expected to place downward pressure on prices for young cattle despite forecast continuing herd rebuilding throughout 2017–18, assuming average seasonal conditions. Australian beef and veal production is estimated to have fallen by 13 per cent compared with the previous year, to 2.0 million tonnes (carcase weight), as a result of a 17 per cent contraction in slaughter. Adult slaughter weights are estimated to have increased by around 4 per cent to a record average of 294 kilograms, which has offset some of the decline in slaughter. In 2017–18 Australian beef and veal production is forecast to increase by around 4 per cent to 2.1 million tonnes. The increase is expected to be driven mainly by higher slaughter in the second half of the year, with relatively high prices and expanding herds giving producers an incentive to increase turn-off. Average slaughter weight is forecast to remain at around 294 kilograms due to increased cow slaughter limiting growth. An estimated 3 per cent rise in Australian cattle numbers to 26.9 million head is expected as a result of improved seasonal conditions in 2016–17. The increase is expected mainly in Australia’s southern beef-producing region and reflects lower turn-off, a recovery in calf branding and lower cattle death rates. In 2017–18 beef cattle numbers are forecast to expand by a further 5 per cent to reach 28.2 million head. Assuming average seasonal conditions, continued herd rebuilding is expected—particularly in major beef-producing regions of Queensland, where dry conditions during 2016–17 limited herd expansion. In 2016–17 Australian beef and veal exports are expected to decline by an estimated 17 per cent to 992,000 tonnes (shipped weight), valued at $7.1 billion as a result of lower beef production. Increased competition in the US market from local production and in Japan and Korea from US exports have placed downward pressure on export prices throughout the year. The chilled beef indicator price (chilled grassfed fullset Japan cif price) is estimated to have fallen by around 2 per cent and the frozen manufacturing beef indicator (cow 90CL US cif price) by 1 per cent. In 2017–18 Australian exports of chilled beef to Japan and Korea and frozen beef to China and the United States are expected to continue to face strong competition. This is expected to place further downward pressure on prices in those markets. Export volumes are forecast to increase by 4 per cent to 1.0 million tonnes, resulting in the value of Australian beef exports increasing to around $7.4 billion. Australian beef exports to the United States in 2016–17 are estimated to fall to around 200,000 tonnes (shipped weight), 40 per cent lower than the previous year. This reflects lower beef production in Australia and reduced US demand for imported manufacturing beef. The expanding US herd has resulted in higher cow slaughter, which has increased volumes of the primary source of US-produced lean manufacturing beef. In the first three quarters of 2016–17, US cow slaughter was 6 per cent higher than in the same period the previous year. Herd expansion in the United States has also resulted in increased US beef exports. In the first three quarters of 2016–17, beef exports were 23 per cent or 124,000 tonnes higher year-on-year. Exports to the high-value markets of Japan and Korea together accounted for most of the increase (94,000 tonnes or 45 per cent). In 2017–18 US cow slaughter is forecast to rise further, reducing demand for imported beef. This is expected to place downward pressure on prices for lean manufacturing beef and result in lower imports from Australia. Australian beef exports to the United States are forecast to fall by 4 per cent to 193,000 tonnes. In 2016–17 Australian live feeder and slaughter cattle exports are estimated to fall to around 825,000 head, 26 per cent lower than in the previous year. This reduction primarily reflects lower exports to Vietnam, where high prices for Australian cattle during 2016–17 are expected to have reduced margins for Vietnamese feedlots and importers. In the first three quarters of 2016–17, export unit values for live cattle to Vietnam averaged around $1,500 a head, 19 per cent higher than in the same period the previous year. Over the same period Australia shipped 95,000 head of cattle to Vietnam, around half the number shipped in the first three quarters of 2015–16. In 2017–18 Australian live cattle exports are forecast to increase by around 6 per cent to 875,000 head (value $1.0 billion). This mainly reflects increased exports to Indonesia, where import demand is expected to remain strong due to higher incomes and limited growth in local beef production. Exports to Vietnam are forecast to remain largely unchanged as high live cattle prices limit growth in exports to that market.